We are the French leader for pre-applied products. Every year, we process more than 60 million parts in our plant in Cergy Pontoise (north of Paris area). We served various industries: Automotive, Aerospace, Defense, Luxe Industry, …with all their own specificities. Our expertise in special parts is renowned all over Europe : we export more than 40% of our turnover. ISO 9001 certified since 2001, our organization is adapted to TS16949 (samples, PPAP, …). – Inserco & Foubert for fasteners and parts on drawing. At the time, liquid bonding products knew a very important development thanks to the progression of the quality that was required to secure threaded parts. The screws are therefore «locked» when mounted with a type of liquid anaerobic sealant. Our complete range of bonding and sealing products are extremely successful within the industry. The automotive manufacturers wanted to withdraw the liquid sealant from their production lines. Soprima therefore developed at their request the manufacturing process to place the first pre-coating products that arrived from Japan. The locking of screws is then carried out by pre-application of a micro-encapsulated bonding products onto the threads. We developed the sealing function with pre-coating products by which our company is specifically renowned. Soprima Industries embarks into pre-coating smooth parts. Our main clients are automotive suppliers for whom we carry out sealing, bonding and press fit connectors. ISO 9001certification for pre-coating activities and sealant distribution. We developed a special machine to pre-coat female threads: bolts, screws and other hollow parts. Launching of repositionable locking by a polyamide coating on the thread. Development of the anti-seizing function by pre-coating threads. 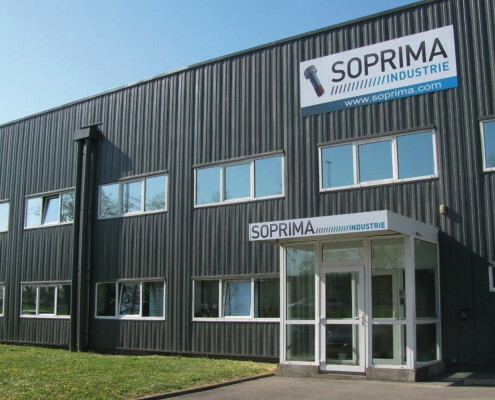 Soprima moves into larger premises to manage its growth. Soprima became associated to Prelok to forme the French leader in pre-coating, representing more than 50% of the market. Soprima also incorporates ACSH company, specializing in micro-screw’s pre-coating and custom packaging. Launching of the pre-coating head under. The technique allows the realization of sealing on screw heads and nuts drowned by removing conventional seals. Inserco Fasteners, company specializing in the sale of inserts and special fasteners , joined the group . Launch of www.soprima-conditionnement.com packaging site dedicated to business custom packaging. To cope with the significant growth of the activity, the work surface is increased to 650 m² .